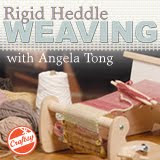 Craft bloggers are so generous and thoughtful. I received more baby love in the mail this weekend. 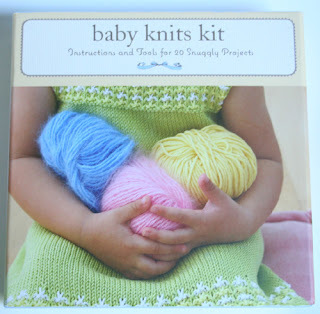 Joyce from Slate Blu sent me the Baby Knits Kit. It's a cute little kit in a box that contains 20 patterns printed on full color cards, circular needles, a fully illustrated technique book and a small skein of yarn. Thank you, Joyce! 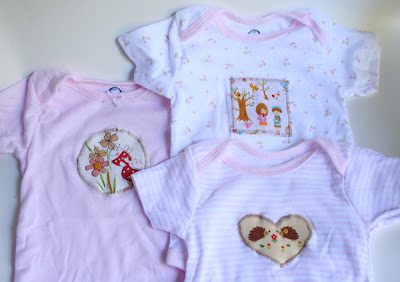 Sara from Rhymes with Spoon sent me 3 fabric patch onesies that she made. So cute! She used the tutorial from Angry Chicken. Sara and I both have the mint green Hello Kitty Janome sewing machine and I love seeing what she creates with her machine. Thank you, Sara. So very glad you liked the onesies! I do hope they get some wear, even though your little one will arrive in the winter. I made some onesies in the same size for another friend and her boy outgrew them by the time he was only 8 months old! I've never understood how they do sizing for baby clothes!! That is so sweet of Joyce and Sara, what cute, thoughtful gifts. oh so cute! I love everything and so jealous you have a hello kitty sewing machine! how adorable! wow, what great mail! those onesies are adorable. As my little girl would say: Cute-cute!